Your ponytail and cap Kerry are in a way trademarked by you. How did it all start? The pony tail thing is a bit of a nod to my native American heritage. My great grandmother was a Cherokee (just a handed down story, but I believe it to be true). But the real reason I let my hair grow is that my brain wants to optimize pretty much every process that I encounter. So at one point I went to get a haircut and as I was sitting in the barber chair, I started thinking about how to optimize that process. I actually wrote about it on my blog here: http://kerryosborne.oracle-guy.com/2009/05/shopping-trip/ But the bottom line is that I calculated that over the course of my life I would loose almost a year by repeatedly going to get my hair cut. And since the quickest way to do anything is not to do it at all. I stopped. Which is your favorite Oracle version? Arguably you are the most famous DBA worldwide, how many presentations have you given in total at conferences, meetings, webcast, etc. How do you see the future of the Oracle database both on premise and in the cloud? I think Oracle will continue to be a vital platform in enterprises. I believe they have the best SQL engine on the planet. They are great at managing transactions, consistency and concurrency. So for those reasons, and the fact that there are tons of existing applications built on their platform, I believe that they will be around and highly valuable for the foreseeable future. I think that many systems will eventually run in public clouds but I don’t believe that the whole landscape will migrate to the cloud. I believe most companies will end up with a hybrid cloud strategy, combining on-prem with multiple public clouds. 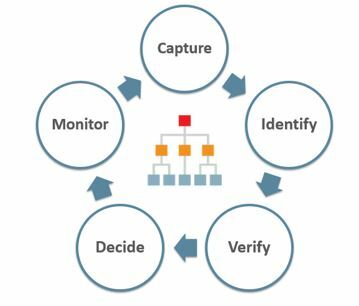 However, there are a number of other tools available that are making a major push into the Data Warehouse / Reporting / Analytics space. So this is the area where I see the most competition for Oracle. Do you think the Autonomous Database puts at risk the jobs of many DBAs around the world? Not really. I do think that the job of a DBA is changing. There are various flavors of DBA’s and some of them (maybe all of them) will need to change their focus. By that I mean, that they’ll need to be more conversant with development. They need to be automating repetitive tasks. They need to be solving higher level problems. But I don’t think Oracle’s Autonomous Database offerings will eliminate a lot of jobs. It will just change them. That said, I think the biggest area of change will be for the people that are doing tasks that are repetitive. Adding storage, installing databases, patching databases, etc… These types of activities will be automated. So start learning how to automate them yourself instead of waiting for someone else to do it. That sets you up with the skill to automate other tasks and moves you into a space that will have more demand. And by the way, that’s basically a development task, so at a very high level, I guess I’m saying that I think people should be moving away from infrastructure type jobs and towards development oriented jobs. How did you manage to create Enkitec as an exquisite top skill group? Such a talent is seldom concentrated in one single company! You have probably given more keynotes than anyone else. Which are you recent and upcoming topics of interest? I don’t think that’s true, but I do a few here and there. I just did one called “How to Stay Relevant” at the Rocky Mountain User Group Conference in February. I’m also speaking at the UKOUG’s conference in Dublin in April and I am hoping to do another keynote at the Bulgarian User Group meeting this summer. The “How to Stay Relevant” talk is about the disruption that’s currently going on in our industry and it focuses on the effects on those of us who work with data (and Oracle specifically). In terms of what I’m interested in these days, distributed systems are high on the list. Any platform that moves the work to the data and that allows access via a SQL interface is of interest to me. What is your take on ML, AI and Big Data? Are these just new trends in IT that come and go? No, I don’t think they are just buzz words! Unfortunately the hype cycle can quickly cause over-used terms to become a turn off. But the general idea of artificial intelligence is not going to just fade away as some trendy ideas do. So with regards to AI (and the subset of Machine Learning) I think we are still early in the adoption and will see more and more of it. We’ll also see a lot of things that are labeled as AI, which are really not. So we’ll have to learn to be educated consumers. Oracle’s optimizer does some things that could be viewed as AI for example. The ability to recognize that it’s made a mistake in it’s determination of a plan is very smart, but also very narrowly focused and does not really use “AI techniques” to make those determinations. But I have no doubt that the kernel developers are thinking about ways to forge ahead into that space. And there are a lot of successes already, specifically with narrowly focused applications (so called ANI). The champions of most intellectual games are AI engines now, just as an example. Artificial General Intelligence is still a long way off in my view, but the Law of Accelerating Returns could kick in and blow us all away much more rapidly than we expect. Big Data is also a trendy term that has been around a long time and that has been over used. But when I think of big data these days, I think more about how we deal with the ever increasing volumes (often produced by machines) that we are called on to manage. We also have increasingly complex kinds of analytics and more advanced processing (AI/ML) that we need to do on the large data sets. This requires highly scalable, distributed computing platforms that are capable of dealing with the volume in a predictable (scalable) way as well as in an economical way. Hadoop is somewhat synonymous with the term Big Data because it was the first (and still is the most popular) such framework in the open source community. As with most technology swings though, Hadoop has gone through a lot of hype (when people thought it would solve all of our technological problems), then a period of disillusionment (when everyone realized this technology, like all others, has it’s limitations/tradeoffs), and is now entering the phase of reasonable expectations, which has led to widespread adoption. This is the classic hype cycle that Gartner uses so heavily. But my view is that Big Data (Hadoop or other proprietary or public cloud based offerings) is definitely not going away, and in fact I believe it will continue to be a huge force of change in our industry. 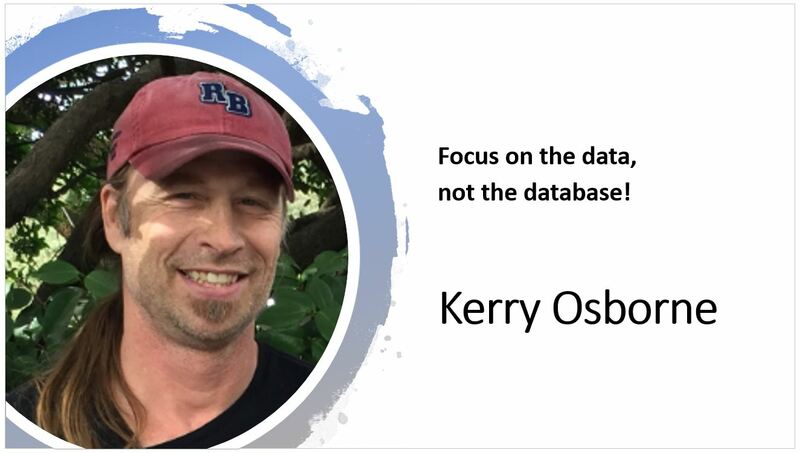 What single piece of advice would you give to the new DBAs entering the database profession? Hard to just leave it at just that: Focus on supporting or becoming a cross over developer. Focus on architecture and optimization topics. … But the one liner is very quotable, right? Some DBAs come from sysadmin background and some from apps/applications. How did you become a DBA? I started as an application developer. Then I started getting frustrated with the lack of control (power) to do what I wanted at the database level and I moved into a DBA role. Then I got frustrated with having to ask sysadmins for help and I became a sysadmin. Then I started doing jobs that combined all 3 aspects. I eventually got focused on optimization of existing systems which combined all of the jobs in my background and I started to learn about the internals of Oracle. And the more complicated the optimizer became, the more important it was to know how it made it’s decisions. I never was the absolute best at any of these jobs btw, but I think being competent in all these areas gave me a lot of advantages that I wouldn’t have had otherwise. Probably the main advantage was that it made it possible for me to look at problems from multiple angles. I’ve worked with a ton of DBAs over the years and some of the very best are the guys and gals with multiple skills sets (Network Admin/DBA, Storage Admin/DBA, Unix Admin/DBA, Developer/DBA, …) And of course having experience building software is a huge plus for anyone in the “computer” business. It gives you the ability to think to yourself, “Now if I had been the developer on this, how would I have coded it?”. This is an extremely powerful view into problems when trying to resolve software issues. If you can add one new feature to the Oracle database, what would that be? There are too many features already. Focus on fixing the bugs! Tell us about Gluent and its flagship product? We founded Gluent to address one of the biggest issues we’ve seen over the last decade or so in our work with large databases in the enterprise space. Fundamentally, Gluent allows existing applications to take advantage of big data platforms, and here’s the most important part, without re-writing the applications. I think the reason for founding the company is best illustrated by a story about a large medical company that reportedly had one of the largest Teradata clusters in the world. The whispered cost was $40M a year maintaining that system and there was a desire to migrate off that platform for cost reasons. A 6 month project was undertaken to see if it was feasible without degrading the performance of the system. The results were pretty amazing. The performance was increased on average over 1000X across a huge number of queries (all the queries from a days worth of work). The annual cost of the proposed solution was about $1M. Nevertheless, the company decided not to re-platform the system. The reason? They were calculating a 3 year ROI, and despite the fact that the projection showed a saving of nearly $120M, their assessment of the risk and cost to re-write the very complex application out weighed the savings. This is an extreme example of a story that plays out every day in the enterprise space and is the reason why Gluent was initially formed. After an implementation of Gluent, the resulting system has a hybrid architecture which blends a distributed back-end with a relational database. The goal being for both components to do what they are best at. The relational database being really good at managing transactions, concurrency and consistency and the distributed back-end excelling at throughput, scalability, and doing so economically. It also allows hybrid cloud deployments where the database component can remain on-prem while the distributed back-end can be deployed in the cloud with some or all of the data in relatively low cost object storage. This sort of architecture allows a great deal of flexibility around data placement between some in object storage, some local to a distributed cluster, and some local to the database tier. It also provides flexibility with regards to security, as some (sensitive) data can be contained strictly on-prem, while less sensitive data is moved out to the cloud, as an example. I could go on (and on and on …). But hopefully you get the idea. We believe that our approach allows existing applications to take advantage of these magical new platforms, but without breaking anything. That’s our secret sauce. Which is the biggest mistake you have ever made as a DBA? Ha – that made me laugh! Early in my career, when I first gained sysadmin privileges, I was still doing DBA and development work. So one night I was working remotely via a 1200 baud modem on a program of some sort (probably Fortran OCI accessing Oracle V3). Anyway, each test run was taking several minutes and I noticed that there were several other processes running night time batch jobs on the system and they were burning a lot of CPU. So I decided that make use of my newly gained sysadmin privileges and I upped my priority so that my test runs wouldn’t have to compete so much for CPU time. Well in those days, the operating systems weren’t as smart about prioritization as they are now. So my process was effectively getting all the CPUI time until it completed (and was much faster – yay!). Unfortunately, at some point I made a change that threw my code into an infinite loop. I tried to break out after a few minutes and unfortunately the modem connection dropped. Since my original process was getting all the available CPU time, there wasn’t even enough left to get logged back into another session to kill the rogue process. The program finally died when it had used up all the disk space. The real sysadmins were not happy with me the next morning! If you can ask yourself a question, and not answer it, what would that be? I still haven’t figured that out! CNBC: 40% of A.I. start-ups in Europe have almost nothing to do with A.I. 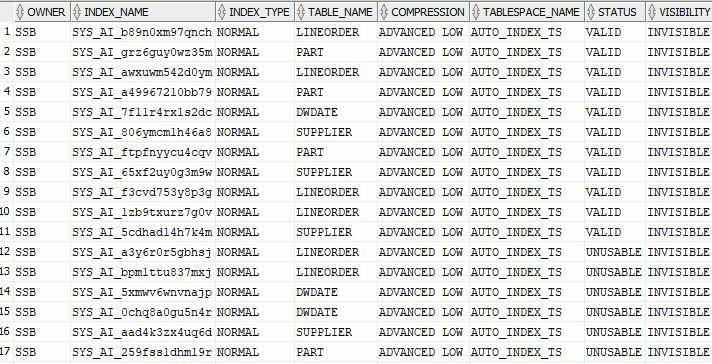 Oracle 19c brings one key feature which does not exist in database systems: Automatic Indexing. Something very similar does exit in Azure SQL Database but with some limitations. For a very long time, both DBAs and Developers, have been struggling (really struggling) with what indexes should be created, what type of indexes they should be created as and what indexes should be dropped from the database. 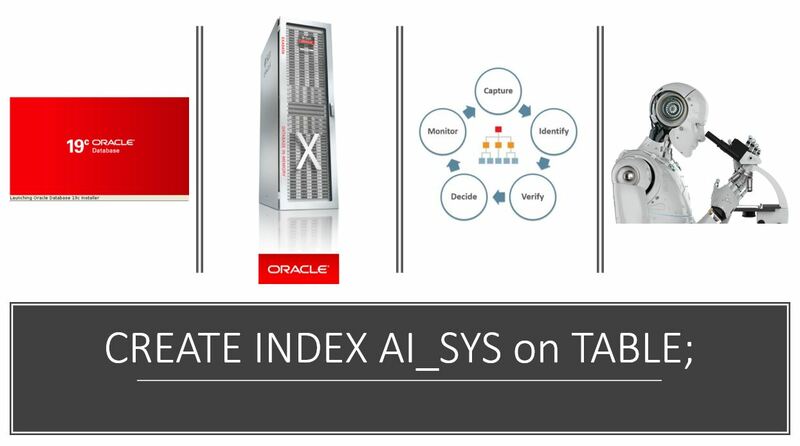 Automatic Index creation (AI Creation) means the explicit creation of new indexes and also dropping existing, unused indexes without human intervention. Then, there is the verification process. Some indexes will become VALID (physical segments are created) but will still stay INVISIBLE to the optimizer. 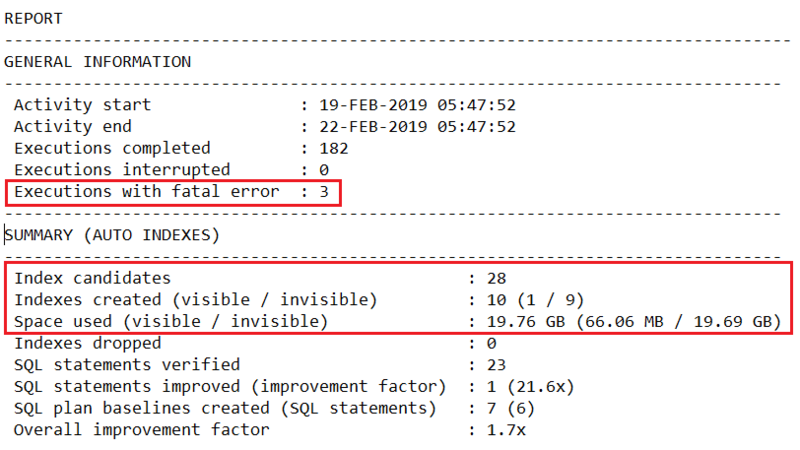 Later, Oracle decides if some of these indexes can become VISIBLE and this happens based on how the performance increases and how these new indexes affect other activities in the database. Automatic Indexing is by far one of the best examples of Artificial Intelligence and Machine Learning in the IT Industry. Really! I still remember a 5TB Oracle database I used to administer (mission critical one, a 24×7 system) where the indexes were almost 4.5TB in size while the real data was like half a TB only.